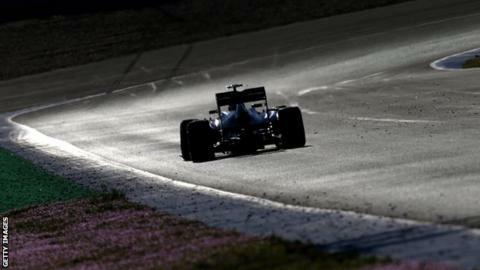 The final day of the first Formula 1 pre-season test was suspended because of damage to a kerb. A pot hole developed at Spain's Jerez track between Turns 10 and 11, where drivers run wide over the kerb. Marshals were able to repair the damage with quick-drying cement, and testing resumed after a 50-minute delay. Red Bull's Sebastian Vettel had set the fastest time, before running was suspended, from Sauber's Esteban Gutierrez and Mercedes' Lewis Hamilton. Testing was extended by 30 minutes until 1630GMT as a result of the incident.